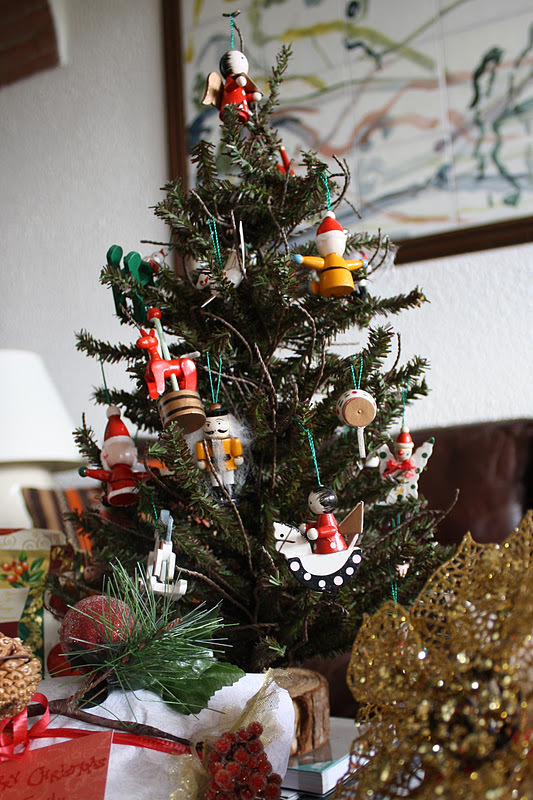 Making Room: Our Life in Sicily: it's beginning to look a lot like Christmas! It has taken us awhile to get our act together, but this weekend we kicked into gear and did some Christmas decorating around here. This is our pride and joy: our book tree. I mentioned before that we might make one, and finally we decided to give it a shot! We chose all our favorite books for the tree, and for a tree topper I cut out a cardboard star and covered it with tin foil. Sweet and very appropriate for this family. We also have a miniature artificial tree that my grandmother gave us. It is originally from Switzerland and comes with itty-bitty wooden ornaments. So far Lena hasn't reached either tree or the presents, but I wouldn't put it past her. This is the first time in our marriage that Elliott and I have had a tree or any Christmas decorating whatsoever. For our first Christmas, Elliott was deployed to Egypt. I left our little undecorated apartment to spend Christmas and New Year's with him. It seems appropriate that we make up for it this year! WOW!!! super cool!! Can't believe you made the tree! Wish I could come visit! I LOVE the book tree - what a wonderful idea!! Wishing your family a lovely holiday. The tree is AMAZING! Such a great idea! oh my gosh! the tree is absolutely amazing. i love it!!! !